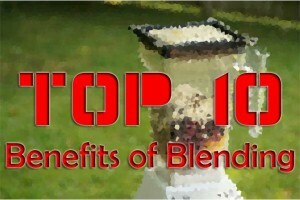 Top Ten Benefits of Blending or Top 10 Benefits of Smoothies. I have a question for you. Why do you juice and not blend? Vitamix? Isn’t some nutrients lost in all of the leftovers in the juicer? Thanks in advance! No rush to answer! I get asked this question all the time and the answer as far as I am concerned is that there are benefits to both. I juice and I blend. 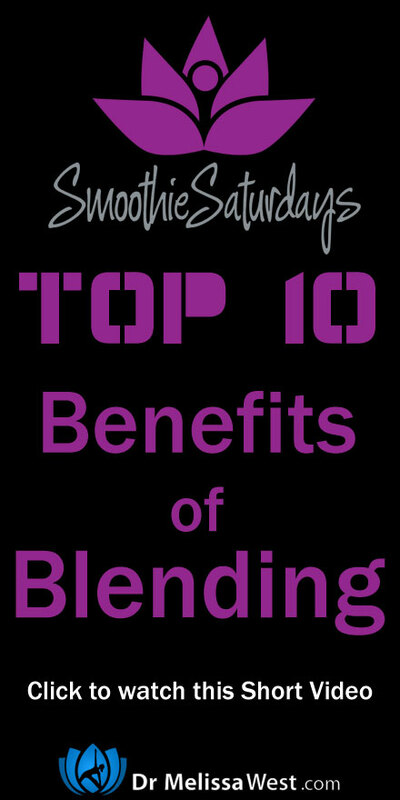 On today’s Smoothie Saturday video we will highlight the top ten benefits of blending with a high speed blender such as a vitamix or a blendtec. 10. Quick and Easy! It can take a long time to prepare your fruits and veggies for juicing, do your juicing in your slow masticating juicer, not to mention the clean up. Smoothies are quick and easy, and the clean up is a breeze! 9. Filling! Smoothies can be made as a meal replacement with protein powders and loaded with lots of nutritional ingredients to keep you going to the next meal. 8. No waste! With juicing you have all the fiber that comes out and for most of us normal un-super human beings gets composted. Aside from banana peels, when you blend, you use pretty much the entire fruit and veggie when you blend and no waste! 7. More stable blood sugar. Because of the fiber in smoothies you will experience less of the sugars entering your bloodstream too rapidly, followed by a drop later on. The fiber in your smoothies will help to regulate your blood sugar levels and also help regulate your weight control. 6. Greens! Smoothies are a great way to add greens to your diet. According to Victoria Boutenko, the Green Smoothie Queen, “Greens are the only living thing in the world that can transform sunshine into the food that all creatures can consum. The life purpose of all greens is to produce chlorophyll. Chlorophyll augments your body’s ability to produce hemoglobin which in turn strengthens the delivery of oxygen to your cells. 5. Superfoods! Blending is a great way to add superfoods to your diet. From maca, spirulina, chlorella, goji berries, to flax … you can drop in your superfoods and easily add a nutritional boost to your day. 4. Fruits and Vegetables. Smoothies allow you to take in your daily intake of fruits and vegetables with ease. You can even hide the taste of your veggies in a super yummy smoothie! 3. Protein! Add a scoop of protein to that smoothie! There are some great protein powders on the market now that are organic, vegan, raw ,gluten free and non-gmo. So add a scoop of protein and get that extra protein boost from your smoothie! 2. Healthy fats. I love adding healthy fats to my smoothies from flax oil to hemp seed oil, they make smoothies nutritious, delicious and super easy to go down. 1. Fiber! Whereas juicing removes the fiber from your tasty drink, with smoothies you get to keep all your fiber. It is recommended that you take in anywhere from 25-30 grams of fiber a day and some sources recommend as much as 45 grams of fiber a day. If you suffer from type 2 diabetes, constipation, or colon cancer it is recommended to increase your fiber for disease prevention and treatment.